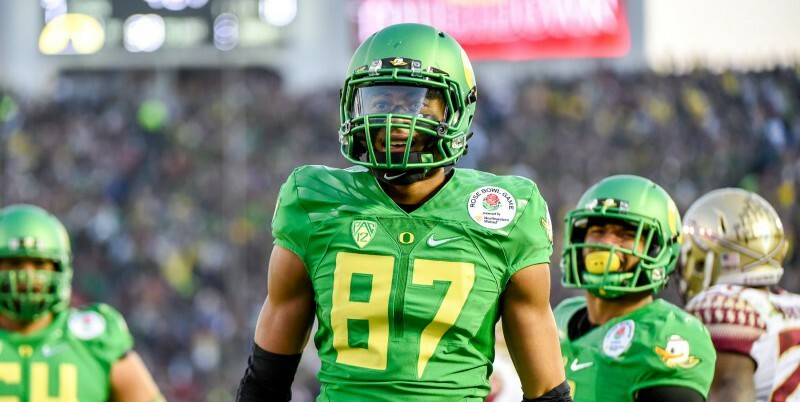 Comcast Sports NW reporter Aaron Fentress is reporting that Oregon wide receiver Darren Carrington failed an NCAA administered drug test, according to team sources, and did not make the trip to Arlington, Texas for Monday’s anticipated national championship game against Ohio State. Sources say that Oregon’s receiver tested positive for marijuana, but the team has the right to appeal the suspension if it chooses to do so. At this time there have been no reports of comments from the Oregon Athletic Department or any staff from the Ducks Football program. *Update*: Foxsports.com reporter Bruce Feldman has clarified that Carrington is not suspended, but instead has been declared ineligible to play. Foxsports sources also report that Oregon has already appealed the decision and been denied.